In the 1970's, when I was enjoying the youth of my 20's, I had hunted the Ruffed Grouse to a great extent in the forests of Central Wisconsin. While I was studying at the University, my friend Gary and I went Grouse hunting every weekend. Gary had a new AMC Gremblin that we used for transportation as we explored the backroads of Central Wisconsin. We became quite proficient at Grouse hunting. We became decent shots; Gary with his .12 ga Browning Citori and me with my .12 ga Model 37 Ithaca Featherlite. We learned to find the Grouse which is a large part of Grouse hunting without a dog. We learned that the Grouse like to eat clover and poplar buds; love water, and need gravel to digest their food. A gravel country road bordered by poplar forests and clover fields with water nearby is an ideal place to find and to hunt Ruffed Grouse. We had no dog and we learned to stomp our way through the thickest thickets in our search for Grouse. We put on more miles than the number of grouse that we harvested but had a great time doing so. We had many fine meals with the Grouse that we harvested. I used to roast the whole bird rubbed with sage and butter at 300 degrees for about an hour and a half. They were delicious prepared this way!! I have since hunted Ruffed Grouse with a professional guide and English Setters and carrying a .12 ga Browning Citori over and under, but I believe I had more fun in the old days when I used to tromp the brush for the birds with my faithful Ithaca .12 ga. In 2004, when I was 50 years of age, I decided to hunt again. I bought a Browning .12 ga Citori and planned a trip to Richmond, Illinois, for a Ring Necked Pheasant hunt. I was offered the services of a guide who furnished a dog. I was lucky and had a German Shorthair named Gus hunt with me. Gus was a great dog and pointed a lot of Pheasants for me. I had a great time at Richmond and decided to treat myself to a Pheasant hunt every year. Since then I have harvested many Pheasants, a double on Hungarian Partridge, and a Chukar Partridge. I have been blessed to hunt with Gus the German Setter who pointed the birds, Sadie the Springer Spaniel who flushed the birds, and Tipper the daughter of Gus who pointed the birds. I have a lot of great memories of my bird hunts with the wonderful dogs and wonderful guides. I treated my family to wonderful Pheasant dinners with my Mom's special Wild Rice dressing. The Dressing consisted of Chicken gizzards and hearts sautéed in butter with onions and a little garlic. These were set aside and celery, mushrooms and sage were sautéed in butter until tender. The giblets were mixed with the celery and mushroom mixture and Wild Rice and Basmati rice were added. This mixture was stuffed into the Pheasants and used to smother the birds or bird pieces. The birds and rice were cooked at 300 degrees until tender and moist. Delicious and enjoyed by all!! In January of 2008 I made a meat hunt to Niobrara, Nebraska, to hunt a Buffalo meat bull and hunt the Ringneck Pheasant. I used my .458 Lott to down the Bison. I helped with the meat processing on the bull. We processed 165 pounds of burger and many other cuts. I used my .12 ga Citori for the Pheasants. I hunted over English Setters and harvested a lot of birds. I came back from Nebraska with a Pick Up load of meat. In 2007 I had been on a Safari to Northern Namibia. I had seen many Guinea Fowl on this hunt and wondered if I could ever hunt them. In 2008 I planned another African Safari for 2009. 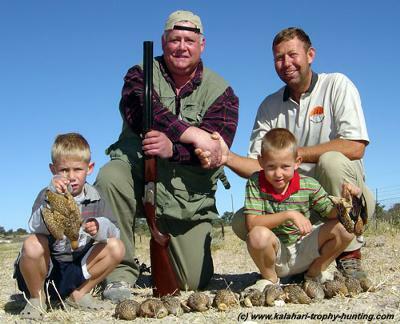 I booked a hunt on Uitspan Hunting Ranch in the Kalahari Desert of Namibia. I planned to use my Mossberg International Silver Reserve .28 ga Over and Under shotgun for Sand Grouse. Michael Duvenhage, the Professional Hunter at Uitspan said I would harvest all the Sand Grouse that I and his family could eat. Providing I could shoot, of course. I did not want to carry all the shells to Namibia, so Michael said he would buy 10 boxes in Windhoek prior to my arrival. little Isabelle. We met Michael's brother in law who is really like a blood brother, Neil, and Michael's father, Hendrik sr. I got out my Mossberg .28 ga and showed it to Michael. Michael showed the shotgun to his father. Hendrik said, "Lekker, baie lekker", which means very very good in Afrikaans. We planned the Sand Grouse hunt for the next morning. Michael said that at 0800 the Sand Grouse start to appear. He said you can set your watch to the Sand Grouse in Namibia. At 0900 the birds come no more. Next morning we got up early and went to the Bostwana border to see if any predators had crossed the border onto the ranch. Besides providing a place to live and hunting wild game on the ranch, the Duvenhages also raise the prized Karakul sheep. A predator intrusion such as a pride of Lions or a Leopard can wreak havoc on the sheep. Michael found a set of Leopard tracks. He said this animal must be monitored if he crosses into Namibia. After patrolling the border, Michael and I, Neil, Hendrik, Jan-Hendrik and his cousin David, and Maria went to the waterhole where the Sand Grouse would appear. I had my .28 Mossberg, Michael had a Russian made side by side .12 ga with .45-70 in one barrel and .12 in the other. The gun had a full choke .12 ga barrel and Michael uses the gun for small predators and Leopards. Now he would use it for Sand Grouse. The children, under the supervision of Neil, had a .17 pellet gun and a .22 rimfire rifle with a scope. They were waiting for the Sand Grouse to alight near water for a chance at a shot. At exactly 0800 we heard a whistling sound in the wind. In the distance we spotted the first flock of Sand Grouse. They circled over the water and flew right over us at a close distance. I missed a few shots with my .28 ga but managed to finally down a fair amount of birds. I gave Neil and Michael a chance with my shot gun. They preferred Michael's side by side. In fact, Michael scored a triple on Burchell's Sand Grouse with the side by side. There were two types of Sand Grouse - the Burchell's and the Namaqua. The Burchell's Sand Grouse was more numerous and it came in waves with a whistling sound. The Burchell's is larger than the Namaqua and has broader wings. They are a beautiful spotted bird. The Namaqua is smaller than the Burchell's and utters a sound like ,"Choc o lot", when it approaches the water. The male Namaqua has a distinctive stripe on its breast. These birds can go 60 miles in their search for water. The Grouse that are nesting saturate their breast feathers with water and transport the water to their young 60 miles away. We let a few flocks alight near the water to give the children a chance at harvesting them with their rifles. Everyone harvested some birds and by 0900, when the birds came no more, we had enough for a good dinner. We brought the birds to Tienie who gave them to the hired man to pluck. We ended up with a bucket of Sand Grouse that were placed in a cooler. On Sunday I helped Tienie clean the birds. We cut off the heads and crop and cleaned the gizzards. We saved the hearts. Tienie started to prepare the Sand Grouse for a big meal at Hendrik's house. I made my Wild Rice dressing by sauté-ing the giblets in butter and onions. Tienie had no sage so I used rice seasoning. I put the giblets aside and made Wild Rice with long grain rice. I mixed the giblets with the rice and placed in a baking pan. We brought the Wild Rice and Sand Grouse to Hendrik's house. Isabelle, Hendrik's wife, had made a fine salad from her garden and we also had corn on the cob from the garden of the hired man, David. The food was delicious and enjoyed by all. The Sand Grouse were well cooked and tender morsels of meat. There was plenty for all. The diners appeared to like the Wild Rice. Neil said it tasted like wheat. I told him Wild Rice is a wild grass that is harvested by the Ojibway Indians in Minnesota and Wisconsin. We had such a good time at Hendrik's house. There was great food, wine, companionship, and conversation. If you ever get the chance to visit the Duvenhages you will be in for the treat of your life. From a strapling young hunter just starting out in the early 70's with an Ithaca pump, to a well seasoned grouse hunter carrying a Gentleman's 28g, we can begin to see how a love of hunting developes. Friends hunting on foot in Wisconson t o new friend hunting in Namibia a life long passion has devloped. I can only guess that the family Duvenhage started the same way and enjoy people like Steven. Happy hunting in the future with many splendid meals. A very interesting story. Sounds like a lot of fun.